ΒΑΡΕΛΙΣΙΑ ΜΠΥΡΑ, ΚΑΦΕ, ΣΝΑΚ, ΟΜΕΛΕΤΕΣ, ΣΑΛΑΤΕΣ, ΛΟΥΚΑΝΙΚΑ, ΜΕΖΕΔΑΚΙΑ, ΤΣΙΠΟΥΡΟ, ΟΥΖΟ, ΚΡΑΣΙ, ΚΟΚΤΕΪΛ.BEER CENTER: ΒΑΡΕΛΙΣΙΕΣ ΜΠΥΡΕΣ: AMSTEL PILSENER, ALFA LAGER. ΜΠΥΡΕΣ ΜΠΟΥΚΑΛΙΑ: GUINNES ΜΑΥΡΗ ΜΠΥΡΑ, ERDINGER,CORONA, KROMBACHER, BUD, HEINEKEN, MYTHOS, AMSTEL FREE. 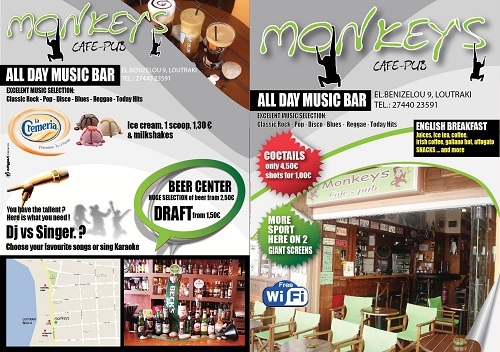 is the coolest place in Loutraki for: Draft Beer, special cocktails, drinks, coffee, snadks... and more.!!! Watch Live sport on2 Giant screens. At night make your own party. Choose your favourite music, be the DJ of the night.!!! The party is here!!! (special offers for groups and students).